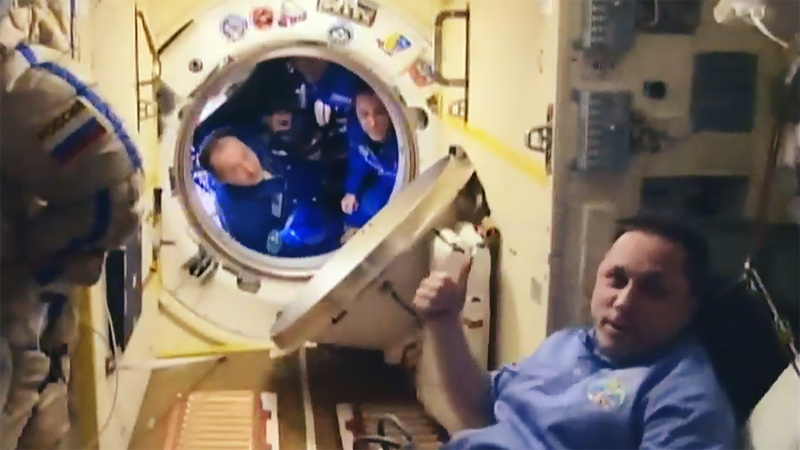 Expedition 55 Commander Anton Shkaplerov (foreground) says farewell to his Expedition 54 crewmates inside the Soyuz MS-06 spacecraft that will return them to Earth today. At 2:58 p.m. EST, the hatch closed between the Soyuz MS-06 spacecraft and the International Space Station in preparation for undocking. Expedition 54 crewmates Mark Vande Hei and Joe Acaba of NASA and Commander Alexander Misurkin of Roscosmos are scheduled to undock their Soyuz at 6:08 p.m. NASA Television will air live coverage of undocking beginning at 5:45 p.m.
Tout le meilleur retour à vous tous.